As I've said before and I'll say again, Brazil knows how to do bugs. I have seen the fuzziest, the most beautiful, the biggest, the most disgusting and most incredible bugs here. And spiders, but that will wait for another day. This weekend it was the turn of the lightning bug, or firefly, depending on where you are from the US. The "pirilampo" or "vagalume" if you are Brazilian. Note: I have only heard them referred to as "vagalume" but according to my source wikipedia, the standard name (as opposed to the popular) is "pirilampo" from the Greek "pyro" for fire and "lampo" for light. But read on: the popular term of "vagalume" is apparently from "caga-lume" which my google translate would have me believe translates to, ummm, "poop out light." You know you love my blog for the elevated level of language I get to. And the hanging prepositions. Did I digress? Yes. So, we were up at our rented country house outside of Joanopolis. I love this place for its isolation, its natural beauty and its ability to turn my city boys into explorers of forests and scientists of flora and fauna. We have no TV service, no phone service, no internet and no cell phone. We do have electricity and running water. We are surrounded on four sides by at least 100 hectares of eucalyptus, pine and native tree forests. Several waterfalls and lakes are within walking distance. At night you cannot see a single light. The view from the fazenda is down a hillside that is quickly surrounded by trees, yet overlooked by the distant Morro Selado, the postcard for Monte Verde, a tourist town in Minas Gerais state. While we were there (three nights), there was not a single starry night but when the sky is clear you can count up to a million stars and have to give up before you've counted half the sky. On Friday evening, we were sitting outside having a last glass of wine (okay, the 7 year old twins were not) when one of my kids saw a glow from the deep dark woods. Cue every horror movie you have ever seen about deep dark woods. This glow was continuous for five seconds, spinning slightly and getting closer at a purposeful speed. It was not like any lightning bug I've ever seen--in Connecticut, these little guys would flash a light for maximum one second and they were tiny. Like the Piper Cub of the firefly world. These Brazilian ones were 747s. They even had bright landing lights on their abdomens. Two glowing spots on its head stayed bright luminescent green. At first we thought they were the eyes, but there were not. The eyes stayed black as coal. The beasts were at least an inch and a half long and brown, attracted by the light of the candles, and later by the living room window. Suddenly there were many of them. We would see them almost click on in the woods and spin towards us across the front grass. The abdomen light shone like a flashlight with a half a foot of beam in front of the beast. When I caught one by holding its wings against its body it spat at me. Yes, it is true; a spitting lightning bug. The arrival of these huge bugs with glowing "ears" and abdomens was strange and wonderful, and happened each of our three nights at the house. We wondered what they did during the evenings there was no one there at the house--we use the house at most two weekends per month. Were they depressed? Did they fly miles to a neighbor's house? Or did they attract and repel each other in the dance of the fireflies? Internet-aided research on my return to São Paulo shows that these are "elaterídeo." 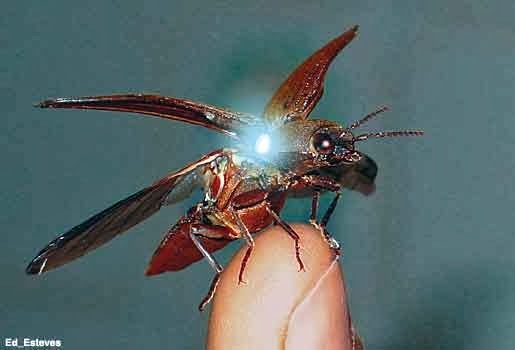 All fireflies belong to the click beetle family and there is one source that claims that these are not fireflies at all but "cucujo beetles". For one source, the fact that the light on their stomach stays lit rather than flashing means it does not fall into the firefly group. I am no biologist so I'm going to wait until my mother-in-law weighs in (she is an USP retired-but-not-really biologist). There are more than 2,000 types of fireflies in the world, of which 100 of the bio luminescent types are present in Brazil. These bugs have a two-year life span, the majority of which is spent in larval stage where they eat, eat, eat. Then they get just one summer as adults to romp and play, and get their girlfriend or boyfriend. The lights behind their eyes are to attract their partners. The lights on their tummies are to see where they are going and to attract--they only use the tummy lights in flight, their "ear" lights are on continuously. Fascinating. I need a Brazilian bug class. This was my favorite of our animal encounters during this trip, but hardly the only one. You'll be seeing some monkeys, eagles and spiders over the next couple of days on this blog. But I stick to my original premise: no country can do bugs like Brazil (apologies to some Asian and African countries that may compete but I have no knowledge). Very cool. I've never seen that type of bug before. And now you've reminded me how cool Monte Verde is. It's been many a year since I last went there. I'm sure it's even nicer nowadays. It was truly bizarre. And very cool. We hiked up to Monte Verde from the fazenda a few years ago--it was a 9 hour round-trip hike and man did that caipirinha (NOT made with rum) taste great. It has built up a bit but the town is still very charming.